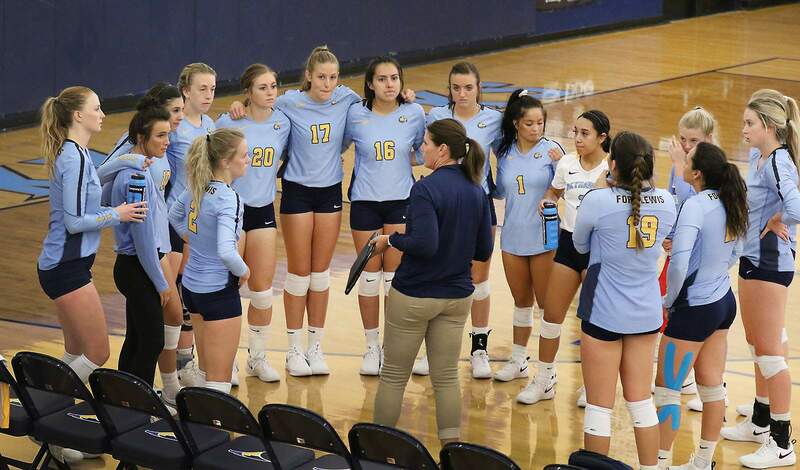 Tricia Melfy, head coach of the Fort Lewis College volleyball program, led the Skyhawks to their first conference tournament appearance since 2013. 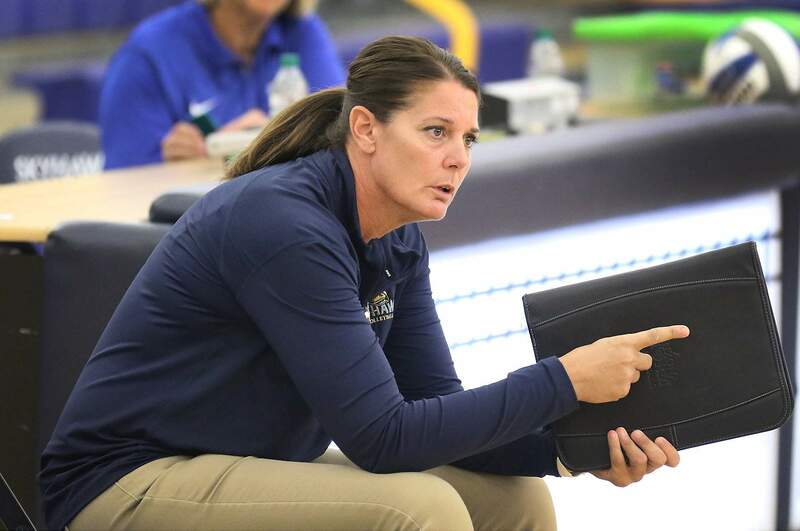 Tricia Melfy, head coach of the Fort Lewis College volleyball program, has had a winning season in 18 of her 23 years of coaching. Maybe it was the perfect storm that Tricia Melfy stumbled upon track and field’s most grueling contest, the heptathlon. The seven-event feat is known for pushing athletes to their limit – something the first-year Fort Lewis College volleyball coach knows about. Melfy has overcome the odds to succeed at Fort Lewis because of an unconquerable drive, a demand for excellence and a passion that has lifted the program – and her coaching career – to new heights. For all the success Melfy has had in her athletic and coaching career, her path to Durango seems as unlikely as her personal story. ‘Tricia the athlete’Melfy was training for her third Olympic Trials in the heptathlon in 1997. She had already made two Trials before, in 1992 and ’96. She was in the middle of running a 300-meter dash when she began to gradually slow down. Melfy thought her ultimate low would have come sooner, though. Her father left when she was 8, while her mother struggled to raise Melfy and her older sister. She grew up in New Jersey, but her family eventually moved to Upstate New York, where life would become complicated. She was in and out of foster care, stayed with seven families in four years and was homeless during her senior year of high school. At 16, she moved across the country from the harsh winters of Upstate New York and New Jersey to sunny Arizona, where her athletic career flourished. Melfy, who described herself as “a lost human,” began to see hope. She tried the heptathlon for the first time late in her senior year of high school at a showcase event, where she broke a national high school record and NCAA Division I schools noticed and recruited her. She would go on to become a three-time collegiate All-American in the heptathlon, including twice at Arizona State, all while she played volleyball at Mesa Community College. She quickly realized she couldn’t abandon the two sports that changed her life, and a former teammate at Mesa, Sharon Akin, helped convinced her to coach. Melfy’s coaching career began as the junior varsity and assistant head volleyball coach at Chaparral High School in Scottsdale, Arizona, alongside Akin. It was the first of five seasons they would coach together. Melfy made her way up the coaching ladder. After more than 15 seasons at the high school and club level, she made her collegiate coaching debut in 2014 as a first assistant coach at Minot State, a Division II school in North Dakota. Her first collegiate head coaching job came in 2015 when she spent one season at the University of Minnesota-Morris, a Division III regional power. She made another stop at Phoenix College, a community college in Phoenix, for the 2016 and ’17 seasons before she was hired at Fort Lewis College in April. New leader of the SkyhawksWhen Melfy took over full-time at FLC, she knew immediate changes had to be made to a program that was down in the dumps. The Skyhawks had not made the Rocky Mountain Athletic Conference Tournament since 2013. The most wins in conference under previous head coach Kelley Rifilato since 2014 was five. Melfy gave every player an 11-page handbook she wrote that outlined expectations, goals and a new program standard. When the team regrouped in August, in addition to a grueling pre-season workout plan that came from her track background, she introduced a mantra that would resonate with every player on the team for the season: “We will.” The phrase would be uttered at every critical point in a match, and it became the rallying cry for the program. For all the energy and time spent remodeling the Skyhawks in the summer, it took half the season before it clicked. FLC went 1-9 to begin Melfy’s tenure. It was a bus ride home after they were swept by Regis University and Colorado Christian University in Denver and dropped to 4-11 on the season when Melfy spoke up and delivered the speech of the season. Her message resounded with everyone, and a rag-tag team, which consisted of six new faces, started to win. FLC won its final five out of seven matches in the regular season and had a six-game home winning streak that including a five-set comeback victory against Colorado Mesa University. The win catapulted the Skyhawks into more than an upset-minded team, but a legitimate tournament contender that was willing to battle and scrap for every point. More than a coachFLC Athletic Director Barney Hinkle saw Melfy’s fire right away. While the dream-like season came to a close against top-seeded Colorado School of Mines in a competitive four-set match in mid-November, the Skyhawks had proved to the rest of the conference how far they had come in just one season. For other players, Melfy was so much more than just a coach: She was a figure who brought back something that was missing. After all of Melfy’s trials and tribulations, she knows her passion for the sport will not fade and believes this is only the beginning at FLC.